Premiership match with Hamilton postponed due to a goalkeeping crisis. However, the Scottish Professional Football League wanted manager Richie Foran to play one of his two 16-year-olds in Saturday’s game at the Caledonian Stadium. Confusion surrounded this fixture before kick-off and there were mixed messages over the statuses of Owain Fon Williams and Ryan Esson. Both keepers were in the hosts’ squad but nowhere near fit, with Fon Williams undergoing round-the-clock treatment for 48 hours to make himself available. The SPFL denied the club’s request to call the game off, insisting they had players available – but Foran refused to name one of the untested teenagers in his squad. The other alternative was to put an outfield player in goal, prior to Fon Williams declaring himself fit. Foran explained: “They wanted us to play one of our two 16-year-old kids, who’ve never trained with us, they wanted us to throw one of those in. “I’ve got a duty of care, to young players in particular, and it was never going to happen. It can ruin a player. “The goalkeeper might never want to play football again if it went wrong for him, he lets in a few goals and has to go back into school. Then it was putting in an outfield player. “The other option was to go find one and we had a few knockbacks. “Yes we wanted the game postponed, but we got a top performance out of the boys and we move on now. “There were a few sleepless nights over the last few days and full respect to Fonners and Ryan, because they could have got a really serious injury out there. But they were willing to play for the badge. “Ryan couldn’t kick the ball – he had a groin strain. Fonners declared himself fit but if Ryan had to go in, he would have had to stand and someone else do the kicking. A spirited second-half display, coupled with a Larnell Cole wonder-strike, earned Caley Thistle a point, cancelling out Ali Crawford’s first-half opener. Questions were raised about Fon Williams’ positioning for Hamilton’s opening goal, with Crawford fizzing in a free-kick from deep on the left flank that went in at the goalkeeper’s near post with 16 minutes on the clock. 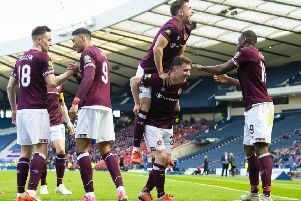 Inverness were soon finding themselves on top, however, and should have had a penalty when Dan Seaborne blocked Lonsana Doumbouya’s header on the line with his arm. Referee Greg Aitken was unmoved, much to home manager Foran’s disgust. Cole, Caley Thistle’s best player in the first half, levelled in the 51st minute, being teed up by Jake Mulraney before smashing in via the underside of the crossbar. Foran’s side saw a lot of the ball in the closing stages but were unable to force home a second goal, extending their winless run to six games. “We haven’t lost a lot of games but we are difficult to play against and beat and that’s pleasing,” he said. “If you sprinkle a couple of wins into these draws you’d be really pleased.